Decorate your fingers with a strikingly unforgettable Marco Bicego Ring. Paradise doesn’t have to be far away when you wear a beautifully delicate and natural piece from the Paradise Collection. To exude elegance, consider wearing a ring composed of the finest stones in the world, handpicked specifically for the Jaipur Collection. 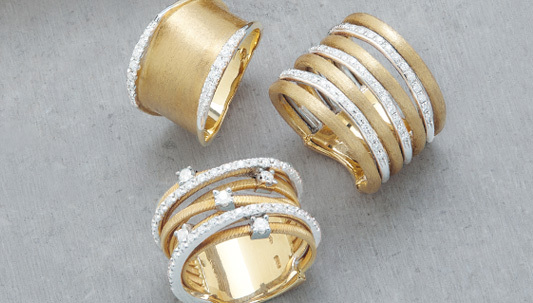 Leave an impression by wearing a perfectly textured and gorgeously contrasted ring from the Goa Collection. Get noticed by wearing a geometrically shaped ring from the highly distinguishable Murano Collection. Whichever collection you choose, Marco Bicego Rings are sure to make heads turn, and be a favored accessory you won’t ever want to leave home without.